“They all hail from the asteroid belt—but not from a single location in the asteroid belt,” he says. “There is no common source for these fireballs, which is puzzling.”…..
Below is an email from Bob Kobres describing a procession of meteors very similar to the procession of Oct 4, 199?, described to me by Peter Brown. I send this to you, Peter, to spur you to publish a summary of the Oct event.As Bob points out, the Feb events may be linked, and there might be a debris stream that may have produced similar activity (with the 1.62 yr period) in 1926, 1947, 1960, 1973, 1981, and 1994, in addition to those observed in 1913 and 1934, and may yet produce activity in Feb of 2007. Going through my latest list of asteroid streams (Icarus 146, p453, 2000), I find nothing that comes close to the orbit by Wylie. The only streams that come near the Earth with theoretically active radiants in early Feb all have radiants below the horizon by early evening, and/or have radiants such that the meteors should be moving south to north in North America and Canada. Hi Jack, it has probably been a decade since I last spoke with you about the 1913 fireball event and its possible relation to your February centered grouping of early evening meteors. I noticed that you had published a paper related to this recently (Icarus 146) and thought that you might have some additional information regarding the 1913 event. I’m particularly interested in C. C. Wylie’s interpretation (last excerpt below) of the fall, as the 1.62 year period he arrives at would seem to place a debris stream near Earth in 1913, 1934, and 1947. 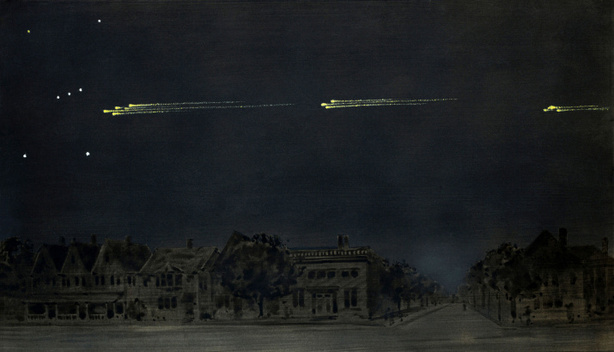 IN the Session of 1902-3 I laid before the Society in conjunction with the late Mr. Arthur Harvey, a catalogue of aerolites or meteors that had fallen to the earth in the solid state, and we both expressed our opinion that they came in recurring showers like ordinary meteors, though the richest meteor-showers seemed to be unproductive of aerolites, while much fainter ones were often accompanied by aerolites or fireballs. It was natural under the circumstances to refer to this catalogue in connection with the great meteor of 9th February, 1913, and I found there three actual stone falls on the 10th of February, one at Nanjemoy, Maryland, in 1825, another at Girgenti, Sicily, in 1853, and a third at Madrid, Spain, in 1896, besides which Mr. Harvey has in the supplemental list one at the Isle of Oleron. France, in 1875. There are, likewise, two falls on the l2th of February and two more on the 13th, one of the former pair being at Homestead, Iowa, in 1875, just two days after the fall at the Isle of Oleron, France. the zone of meteors circulating round the sun.” (XXVI. Royal of Irelaud, at Dunsink, near Dublin, and also by Mr.
there is some reason for thinking so in the present instance. beginning and those on the 12th and 13th may perhaps have had. a different source from those on the 8th, 9th and 10th. Wyoming, Montana, Idaho, Utah, Colorado, Kansas, Iowa, and South Dakota. have come into view at a point even farther west than has been indicated. a distance of about 160 miles. that the earlier half of the flight was more brilliant than the latter half. exception of two persons in Burwell. would certainly in part account for its reduced luminescence. No fragments from this fall have as yet been reported. any special significance, or do they bear any relation to each other? that prompt investigation, this study would have been quite impossible. on the horizon in the east-southeast. such reports on several meteors. Third, only shadow-casting meteors come low enough for detonations. twenty-five miles, the end of its. path is very near. Fisher and Hoffmeister have questioned whether it is completely correct. determination of the radiant or a calculation of a real path. at 10:15 P.M., C.S.T. (11:15 P.M., 75th meridian time). Atlantic time (9:00 P.M., 75th meridian time). Fort Frances, Ontario, 9:00 P.M., C.S.T. (10:00 P.M., 75th meridian time). of eight, passed north of overhead. Mortlach, Sask., 7:10 Mountain time (9:10 P.M., 75th meridian time). seven distinct meteors, two burst. number of meteors seen singly and in groups. the fall of the detonating meteor, as people were looking up then. Only two or three were definitely not from the leading radiant. agreement with the leading radiant. Denning. No time or radiant is given. asteroids which come close to the earth, rather than those of comets. rather than asteroids. The following are the elements obtained. Ontario at 9:06 P.M., 75th meridian time. the detonations occurred during or after the display of shooting stars. The approximate velocity was obtained from the estimates of duration. the right ascension and declination of the true radiant were obtained.